InstaReM, Southeast Asia’s leading digital money transfer company has been awarded the “Network Accelerator” award at Ripple’s first ever Blockchain Innovator awards. 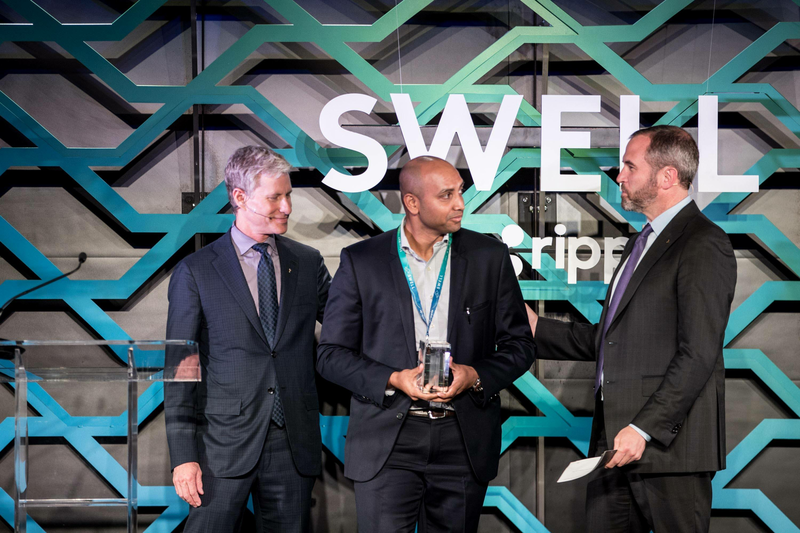 The award was announced at Ripple’s Swell Conference last week with InstaReM triumphing due to the number of currencies for which its able to provide, making it a faster, more transparent payment experience. The award recognises InstaReM’s great work in utilising Ripple to open payment corridors including the one between Southeast Asia and Latin America with fellow Money Transfer Operator BeeTech. October 2018 - InstaReM, Southeast Asia’s leading digital money transfer company has been awarded the “Network Accelerator” award at Ripple’s first-ever Blockchain Innovator awards. The award was presented at Ripple’s Swell Conference last week in San Francisco. The former US president Bill Clinton was the keynote speaker at the Blockchain mega event. Ripple’s Network Accelerator Award recognizes the company that has brought the most matches onto its RippleNet. InstaReM has been able to provide transfers in a number of currencies and a faster & more transparent payment experience, which helped it clinch the prestigious award. ` countries, spanning across six continents and InstaReM has been one of the key members with significant presence across Asia-Pacific, Europe, and North America. The award signifies InstaReM’s contribution towards utilizing RippleNet to open payment corridors, the first one initially opened was between Southeast Asia and Latin America with fellow Money Transfer Operator BeeTech. The two companies also shared a keynote at last week’s Swell Conference where InstaReM CEO Prajit Nanu and BeeTech CEO Fernando Pavani shared their experience in making payments live between Latin America and the Asia Pacific – faster and cheaper than ever before. The trade between Australia and South America - two most economically dynamic parts of the globe - has grown sharply over the past few years. Between 2015-2016, Australia's total trade with South America was valued at AUS$11.2 billion, with Brazil, Chile, Colombia, and Argentina being Australia's key trading partners in South America. The InstaReM-Beetech’s RippleNet partnership is benefiting businesses on both sides by way of huge savings in cross-border money transfers. InstaReM’s remittance hubs are spread across Asia-Pacific, European Union, and the U.S. with an operations office in Mumbai, India. InstaReM is a Singapore-headquartered cross-border payments company. Founded in 2014, InstaReM is licensed as a Money Services Business (MSB) in Singapore, Hong Kong, Australia, Malaysia, India, Europe and the USA. It powers local payments to more than 55+ countries across the globe. InstaReM has created a unique payment mesh in Asia, which is being leveraged by financial institutions, SMEs and individuals to make fast low-cost cross-border payments. Since starting operations in August 2015, InstaReM has raised US$ 18 million in two rounds of funding. Its investors include Global Founders Capital, Vertex Ventures (VC arm of Temasek Holdings), Fullerton Financial Holdings, GSR Ventures and SBI-FMO Emerging Asia Financial Sector Fund.